The John Smith’s Stadium is ideally situated in the heart Huddersfield about 30 minute drive or train journey from Manchester and 20 minutes from Leeds. 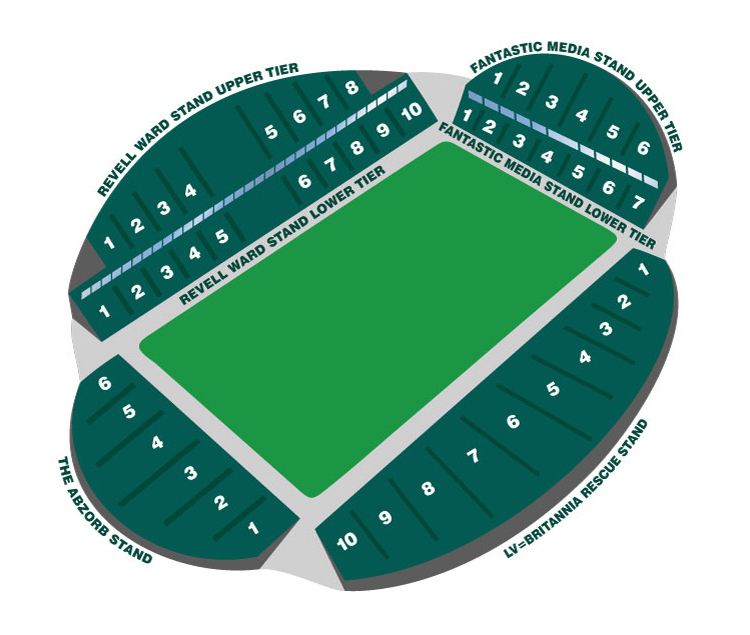 Located close to the M62 and the M1 motorways and with prime rail links, the Stadium offers easy access for all. Exit the M62 at Junction 24 onto the A629 (Halifax Road) and follow the signs towards Huddersfield Town Centre. 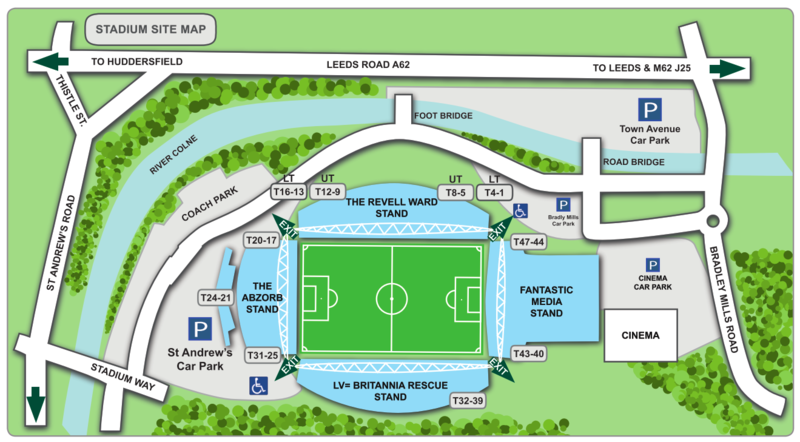 After approximately 2 miles follow the signs for the Stadium, turning left on to Castlegate ring road, turn left onto Leeds Road (A62) then follow the official car park signs. Exit the M62 at Junction 25 and take the first exit at the roundabout onto the A644 (Wakefield Road). After approximately 1 mile, at the roundabout junction of the A62, turn right taking the second exit A62 towards Huddersfield (Leeds Road). Continue for approximately 3 miles and then follow the official car park signs. Exit the M1 at Junction 42 and continue west on the M62. Exit the M62 at Junction 25 and take the first exit at the roundabout onto the A644 (Wakefield Road). After approximately 1 mile, at the roundabout junction of the A62, turn right taking the second exit A62 towards Huddersfield (Leeds Road). Continue for approximately 3 miles and then follow the official car park signs. Car Park is open to all customers, visitors and staff on site and once the relevant business closes the car park will also close. If using the SATNAV Postcode HD1 6PG will automatically bring you to the upper tier car park in St Andrews Road, open Monday to Friday 06.00am to 18.00pm only. Using the SATNAV Postcode HD1 6PJ will bring you to the Town Avenue Car Park at the North End of the Stadium, which, other than on match days, offers free parking for customers and visitors to the Stadium. Huddersfield Railway Station is situated in St.Georges Square and is approximately ½ mile from the Stadium, with frequent services to Huddersfield from many city centre locations including Manchester and Leeds. The average journey time is 20 minutes from Leeds and 30 minutes from Manchester. Regular bus services are available from Huddersfield Town Centre, near to Huddersfield Railway Station. The two closest airports to The John Smith’s Stadium are Leeds Bradford International (LBA) and Manchester International (MAN). Leeds Bradford is located approximately 22 miles away and Manchester International is located approximately 44 miles away.